This laser is so versatile that we are able to easily switch from flat sheet cutting to tubing pipe laser cutting. It has the ability to cut square, rectangle, round, c-channel, and angle, which makes this extremely useful for complex welding projects. Even if the tubing or pipe is bowed, it can still laser cut without vibration and still maintain accuracy! If your company is in need of tube laser cutting services, or if you have tubing in your product and require it to be cut for welding, we provide you with competitive pricing and great lead times using this new laser. Please visit our Request For Quote page to learn more about what we will need in order to provide you with a quote. For more information on our other in-house lasers, check out our Laser Cutting page. 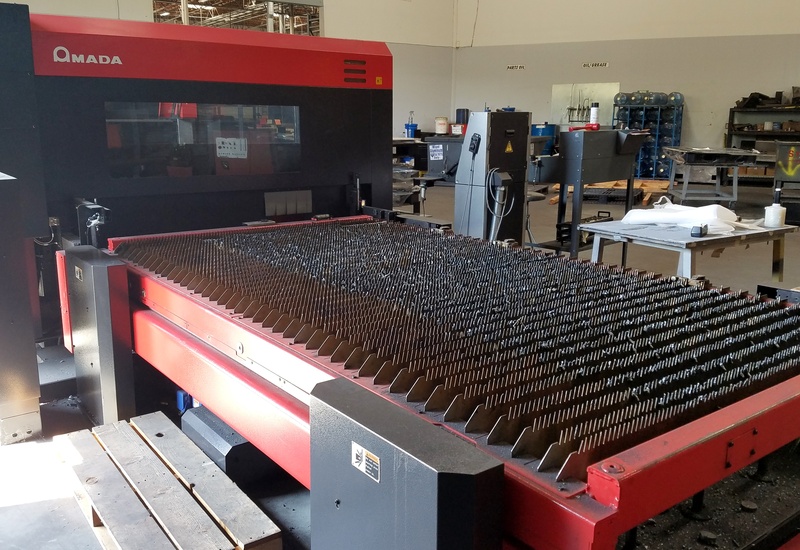 In addition to laser cutting, we also provide metal punching, metal forming, machining, welding, assembly, and metal finishing all within our state-of-the-art 153,000 square foot facility! This entry was posted in Metal Talk, MFG, Types and tagged angle laser cutting, laser cutting with rotary index, pipe laser cutting, tube laser cutting by Britney Blue (Payne). Bookmark the permalink.